There is a shiny headstone on the outskirts of Springfield, Missouri, and it’s where people who love my dad go when they want to be alone with him. I live 13 hours away. Over the river and through the woods. That’s how my old man would’ve said it. He and I had different ideas about what to do with someone after they die, and I figure that’s why he keeps showing up when I sleep. In my dreams, Dad stands with relaxed shoulders, his spine loose and his head cocked just a few degrees to the right. His eyes watch purple charcoal clouds swirl over flat land, dangerous, angry, and anonymous. They form an unsettling wall and crawl toward us, a gray-black combine in a straw-house cornfield. Dad seems at peace. In fact, he looks almost happy at the coming chaos. Where he should be terrified—where I should be terrified—I feel as close to him as I ever have. Together we watch as the funnel drops down from the horizon line. I try not to tell many stories about the three Ds (diets, dogs, and dreams) because they fall into the same categorical hole of interests that are only interesting to the storyteller. But this moment is not a nightmare, and it’s not even really a dream so much as it is a memory. The soundtrack of my southwest Missouri childhood is the jangled harmony of the tornado sirens and KTTS radio’s weather warning. They are both terrible and sharp sounds, the kind of rusty metal screams that turn a hot day into cold sweats. I grew up in shadow of the Cold War’s mushroom cloud, but there was nothing scarier than the possibility of an Oklahoma storm blowing in a tornado that would kill us all. We ducked and covered for Russian nukes, but even as third-graders we knew we were more likely to die at the hands of the God we prayed to. To watch him, Dad wasn’t afraid. He’d stand in the limestone gravel of our driveway—and then years later on the black asphalt that replaced the rocks—and watch the western sky turn orange, purple, gray, and black. He was a man who could track—with literally killer accuracy—a single niggling mole under his green lawn. He did the same with the clouds. It was a silent, patient meditation on movements beyond his control. This is how I remember my father, a man who could sit for an hour and watch something none of us could see. It didn’t matter how much the radio screamed. Dad would stand with his head on an axis offset from our own gravity and decide whether we were in danger. Then and only then would we run for shelter. Sometimes it was to our house. Sometimes it was to a hospital parking garage. Every time, it was exhilarating and wrapped with the kind of complete trust only a child can have in a father. Several tornados hit that town in the 18 years I lived there, but I never saw one hit the ground. It was probably no great coincidence that everyone I knew turned to my dad when the chaos became overwhelming. Even when a June thunderstorm wasn’t coming up from Miami, OK, Dad watched the world tumble and shake, and he made sure everyone was safe. Whether we stood over caskets or the wreckage of our own bad decisions, Dad found a way to put chaos in a box. I saw him cry only twice in my life, and both times it was because of things he didn’t see coming. I think of all this now because the dreams are happening more frequently than they did right after his death. Sometimes Dad is a younger man still sweating from a game of basketball in our driveway. Sometimes he’s the white-haired grandpa he was when he died. He’s always watching the sky, sussing out the meaning behind the smallest black swirls in the clouds. I would relegate it all—the recurring dreams, the ozone-aired memories, the slow-motion movements of my dad’s head as he watched—to no more than a byproduct of ongoing grief. That’s probably the most rational explanation. But before I can think too long on what it means for me, I think of my kids. Someday—sooner or later—I’m going to be gone. Maybe my boys will dream as I do, and if so, I wonder what that dream will look like. Will I be sitting on the bathroom counter playing my guitar while they take a bath? Will I be standing over a pot of gumbo on the stove? How will they see me after I’m gone? I don’t know if there is any way to predict it or plan for it. I’d be lying if I said I wasn’t terrified every day that I’m messing up the dreams they’ll have when they’re 40 years old. The weight of it is sometimes so much that I’m afraid to do anything at all. But then I think of my dad again. 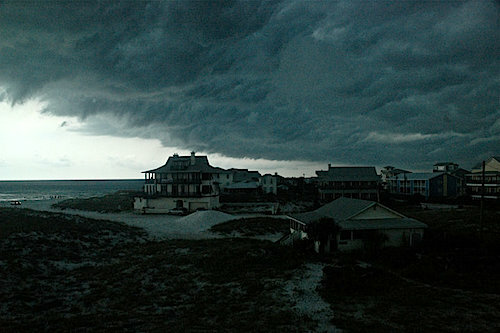 A couple of summers before he died, Dad stood with me on Grayton Beach and watched this storm creep across the sky. There was wonder and joy absent of fear in his eyes. He was a man at peace in himself as the world looked like it was at its end. This wasn’t a dream, and I’m glad for that, because it’s real, and it’s not even old enough to be a memory yet. I had the dream again last week. Dad was older this time. We were both adults watching the sky together. If I have that dream for the rest of my life, I won’t be disappointed. When I wake up, there is always a gauzy half-second where I have to remember Dad is gone, and there is always a slow-slip into reality that makes me unbearably sad. But even that sadness doesn’t last long, because every dream feels so real, it’s almost as if Dad is still alive. What’s left of him is what makes me dream. Of all the things he gave me, of all the things he taught me, of all the things he wanted for me, the greatest was the ability to detach myself from the daily reality and chaos. It’s during that untethered and floating time that I can be with my dad and he can continue teaching me how to stand fearless in the chaos. Yes, there is a place on the edge of Springfield, Missouri where the people who love my dad can lay flowers on his grave and think about his legacy. Though I rarely see that place, I’m at peace knowing that if I want to visit my dad, all I have to do is go to sleep. 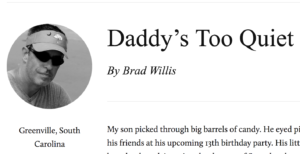 Amazing story Brad, thanks for sharing it. Knowing that I’m more than a few years older than you, it was a surprise to see how much we have in common when it comes to youthful memories. I grew up in NE Oklahoma. The “duck and cover” drills at school and springtime marked by tornado sirens were just as you describe. Only once, in the mid 1950s, did my dad decide that our frame on slab home wasn’t the place to be as a storm approached from the SW. We piled in our 49 Plymouth and headed to a nearby shelter which required driving toward the storm. I remember swirling charcoal clouds tinted green, and hail starting to fall as we ducked into the shelter. Whatever it was lifted, and there was no damage… just a very vivid memory brought back to life by your story. As for dreams, the past half dozen or so years have seen “regular” dreams occasionally replaced by something much more realistic. Sometimes they involve people I know or have known, while other times I find myself a stranger in a strange land. In every case I find the experience so positive that I look forward to going to sleep on the chance that a “special” dream will follow. You continue to inspire me with your words. I’m calling my dad, right now. I could only be so lucky. Maybe you’re dad actually is that lucky. Sometimes I wish I could just reach out and give you a hug for being such a good man and such a good writer. I’ve been struggling with much the same half-second gauziness myself lately. Not because my dad is gone, but because he will be sooner than I’d like to let go. We recently lost the one person on earth who knew my dad his entire life. 82 years (at the time). How many of us will ever be able to say they’ve known someone that long? After hearing of Al’s passing, I wondered how my dad could possibly look at life with joy ever again, but then I realized that he has so many of us who need him and love him that he simply goes on and does what all good dads do: they give us love and give us reassurance when we need it most. You’re dad is still doing that. He just has to reach a little further to give you the encouragement you need. 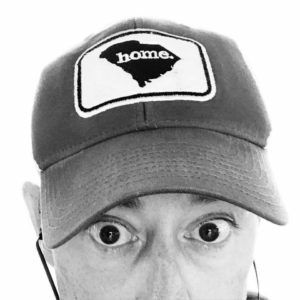 Hi Brad, first time reader/commenter here, bounced over from your guest post on Wil’s blog. This really hit me. I never knew my dad, he left before I was born and family lore tells me he even denied I was his. There was a parade of stepfathers, none of whom were worth even that title let alone the revered “Dad”. When I hear someone describing their father in such warm and loving terms I am at once envious and so very glad for them. In marrying my second husband I gained a real father for the first time. He’s gone now and I miss him every day, but he was the Father of my heart and I’m so glad I had him, even if for only a few years.